Skipping breakfast on any day can lead to a higher intake of foods high in carbohydrate, fat, and sugar in the evening. While this is important for our everyday habits, it’s especially crucial before Thanksgiving when we’ll be presented with food options that are higher in all three nutrients than our usual fare. Couple this heightened desire for high-calorie foods with a raging feeling of hunger from morning starvation, and you have a recipe for calorie overload! Research shows that skipping breakfast doesn’t translate into lower daily calorie intake. People that skip breakfast tend to compensate for their lack of morning intake with larger intakes at lunch and dinner. The same is true on Thanksgiving day; however, the foods that you will be compensating with are much higher in calories. Instead of trying to diet in the morning and overly enjoy in the evening, start the day with a normal, balanced breakfast that’s complete with protein, carbohydrates, and fats. If you are eating a Thanksgiving dinner instead of lunch, have a smaller meal or snack 3-4 hours before the feast so you do not head into the meal with uncontrollable urges for everything on the table. A solid breakfast of eggs, oats, and fruit will do the trick! Another reason to treat the Thanksgiving meal like it’s just any other day is that our bodies are wonderfully built and can adjust for the rare high-calorie meal. It’s not hard to tally up a substantial calorie intake when you consider the gravy, side dishes, second helpings, alcohol, and dessert that usually accompany the turkey at Thanksgiving. The typical Thanksgiving meal can range from a modest 1,000 calories up to 7,000 calories for the hungriest of eaters. If you are familiar with calories, you may remember that one pound of body weight is equivalent to 3,500 calories. The person that consumes that 7,000 calorie meal would, theoretically, be expected to gain two pounds after the feast. This isn’t actually what happens, though. Most people don’t gain weight after a single high-calorie meal. One theory is that the body regulates the irregular calorie intake via thermogenesis, which is the body’s production of heat. Two main factors influence this: digesting food and regulating body heat, although psychological factors and drugs can also increase it. Thermogenesis makes up roughly 10% of the calories that our body burns each day. It is considered adaptive, which means that it can increase or decrease to control the number of calories burned, and ultimately our body weight. So, back to that Thanksgiving meal, the body is most likely burning a higher percentage of overall calories just because of eating the meal. Digesting more nutrients = producing more heat. It is also likely that heat production increases to burn the excess energy consumed. Have you ever noticed that you were hot in normal conditions or woken up sweating in the middle of the night after a big meal? This is your body’s natural response to excess calories. This isn’t a reason to overeat every night, though. This one-off large meal can be easily handled by the body, but a habit of overeating can lead to the deposition of body weight. Finally, and perhaps most importantly, developing a regular routine with eating that does not use food as a reward or punishment is essential for a healthy relationship with food. No meal should be a reward for fasting or dieting. It also should not warrant punishment by under eating the next day. In the long run, your eating habits day in and day out will have the greatest impact on health, performance, and longevity. Enjoy the meal and move on. Celebrate Thanksgiving for what it is: a time to be thankful for the people, places, and things in your life. Don’t look at it as an opportunity to binge eat. Conversely, don’t fear the plethora of higher calorie items. If you are spending time with friends or family this Thanksgiving, let that be the focus, not the meal itself. Your overwhelming hunger should not distract you from the things you are thankful for! The next day, you should reflect on the positive aspects of the day, not the number of calories you ate. Your health won’t be affected by one meal, and neither will your biomarkers! 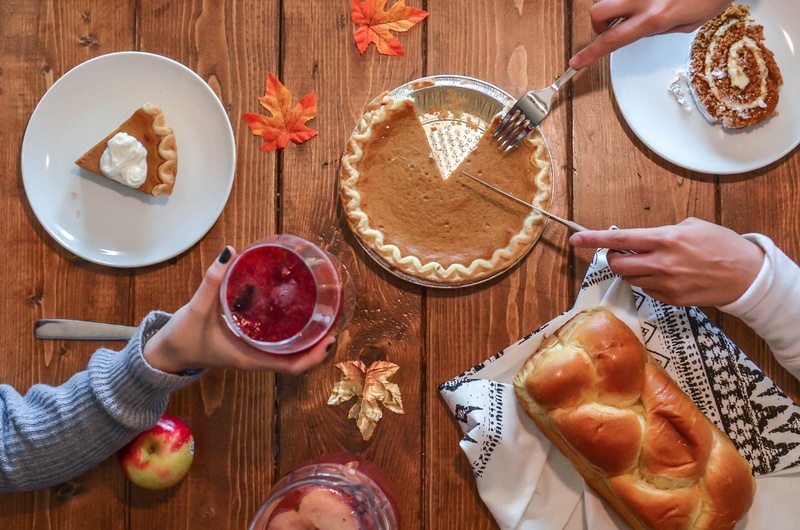 Start your Thanksgiving morning with a good breakfast, make sure to drink water during the day, enjoy your time with family and friends, and resume your healthy habits the next day. Not sure what healthy habits you should be following? Get tested or upload blood results and let us tell you! Is Inflammation Affecting Your Training or Recovery? Gwin, Jess A., and Heather J. Leidy. "Breakfast Consumption Augments Appetite, Eating Behavior, and Exploratory Markers of Sleep Quality Compared with Skipping Breakfast in Healthy Young Adults." Current developments in nutrition 2.11 (2018): nzy074. Tappy, L. "Thermic effect of food and sympathetic nervous system activity in humans." Reproduction Nutrition Development 36.4 (1996): 391-397. Berg, Frances M. "Thermogenesis and the thermal effect of food." Health At Every Size 8.5 (1994): 87.